There are several varieties of roses out there that claim to be "blue" but the reality is there is no such thing as a rose that is true blue. The Blue Moon is widely regarded amongst professionals and home growers alike as one of the closest bred to that elusive and desirable color. 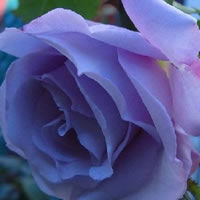 Bordering more on the "blue" shades of lilac, the climbing Blue Moon roses are probably the best you are going to find out there, if you want to add shades of blue roses to your garden! The Blue Moon is a very vigorous grower that produces amazing double blooms up to 4 inches in diameter and offers a fragrance that is sure to please anyone. As a climber, the Blue Moon grows upwards of 8 to 10 feet tall and will quickly cover any fence or trellis that you give it for support. It is not as hardy as some other varieties we've covered in this section, but it will do quite well in zones 5 through 10. If you are considering adding climbing Blue Moon roses to your garden don't worry, you should have no problem finding them either online or at your local greenhouses. If you purchase them online you are most likely going to receive them in early spring as a bareroot plant. If you want to start off with a rose bush that has already come out of dormancy then just wait a few weeks and try to buy yours in a container locally. Either way planting your Blue Moons is easy to do. The first thing you will need to decide is where to plant your new rose bush. Keep in mind that even though the Blue Moon is technically a hybrid tea and doesn't get as tall as some other climbers, it will still get quite big if you give it the proper support and space. You are going to want to keep it about 3 to 4 feet away from other plants, just to make sure it has enough room to spread out. It is also very important to give it adequate sunlight. 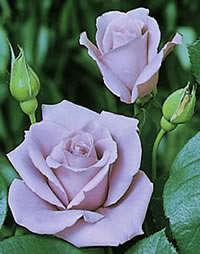 Climbing Blue Moon roses need a site that gets a minimum of 6 hours a day of direct sunlight, but the more the better! Another important factor in growing healthy roses is air circulation. Surprisingly, this is one of those things that many novice gardeners overlook when choosing a site. It is easy to forget or ignore if you are dealing with an environment that has limited space, but remember, roses need proper air circulation in order to help them fend off diseases. If you want to keep your climbing Blue Moon roses healthy and vigorous, make sure you choose the right location to plant them! No matter if you received your Blue Moon as a bareroot plant or in a container, dig yourself a hole that is either bigger than the container it came in, or is big enough to allow the roots of the bareroot plant to fully extend without being folded over on itself. It is also important to plant your new rose bush with the union bud just an inch or two below the top of the soil, so make sure you dig the hole deep enough to accommodate. No matter how good you think your soil is, it can always be improved by adding some sort of organic material. I prefer to use a good compost either from my backyard, or I'll pick up a few bags from the local garden center. Before you plant your Blue Moon in the hole, don't be afraid to line the hole with a generous amount of compost before setting your new plant. Then when you back fill, mix in the compost with the existing soil and fill in around the roots. Once you have the hole completely filled, give it a thorough watering, being sure not to water the leaves of the plant. Excess water on the leaves of rose bushes may not dry out adequately and could be an invitation to diseases. 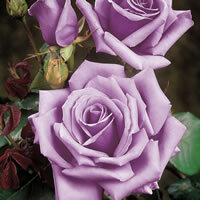 Caring for your Blue Moons is much the same as caring for any other type of rose bush. 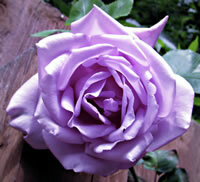 Once planted, a good idea is to give your rose a generous layer of mulch. This serves several purposes. First off mulch is a great weed barrier and goes a long way towards making your garden as low maintenance as possible. Secondly, mulch will also help retain moisture around the base of your roses. 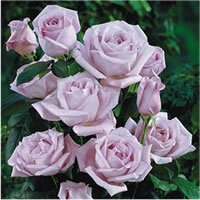 Since roses are typically very thirsty plants, this will help them in growing big and strong. One other thing that mulch does that many gardeners do not know is it helps prevent diseases and pest infestations. Most of these undesirables exist at the soil level surrounding your plants. When you want a plant with bare soil, it is not uncommon for dirt and particulates to splash up onto the plant's foliage, this includes pests and diseases. By adding a barrier of mulch between the plant and soil, you help to protect your plants. Who would have thought that something so simple could do so much for the plant? You can follow a fairly standard feeding schedule when growing Blue Moons. An all-purpose fertilizer is sufficient 3 times throughout the year. Feed once in early spring to give your roses a good jump on the season. Feed them again during the first bloom of the year, and then once more sometime around the middle of July. Beyond that give your roses a good watering every week or so, if Mother Nature isn't doing the job properly, and your Blue Moons should give you a show that is sure to impress!